Last month I celebrated or not my 9 year anniversary of being sick. You’d think with this much time passing and me not getting any better I wouldn’t feel like I still have to constantly explain what is wrong with me those that know me. I do try to cut them some slack, obviously there is a lot wrong and even I struggle to remember every single condition. However it does become really grating when yet again someone asks a stupid question or suggests a cure or tells me they “feel” the same way I do. I will apologise in advance because this is probably going to turn into a slightly ranty post. I do feel that it is warranted due to the sheer lack of understanding that is displayed towards me. So just to clear things up I will break it down for those of you struggling to understand. When I say I am tired, I am tired. Not tired as in I have been to the gym, had a haircut and wandered around the shops for a few hours tired. It is not the kind of tired where you’ve worked an 8 -10 hour day. I am the kind of tired where I haven’t slept more than 4 hours a night for a few days or I have had excessive amounts of pain to deal with or I am fighting an infection which is causing my PoTs to go crazy or I am dealing with all of those things. I am the kind of tired where stringing more than a few words together is difficult, I am so tired that I could fall asleep standing up (if I could stand for longer than a few minutes without feeling faint or fainting). I feel so tired that it’s actually getting difficult to walk because I am struggling to lift my legs up. This is where I cut people a little slack because I am tired pretty much all of the time. After a few hours of being out of bed I would quite happily go back there for the rest of the day but I can’t because my back would cause me all sorts of problems. I guess the issue is language due to there being a limited amount of words to describe what I am feeling. Exhausted seems a little melodramatic for my liking, using it every day would diminish its effect. Fatigue is another word I have an issue with again because it just doesn’t sound quite expressive enough. Saying or texting the sentence “I am fatigued” just seems a bit wishy-washy. I’m shattered equally doesn’t really cover it. It’s the kind of word you use after a 5 day week and partying all weekend, it is a throw away term. The problem is so many people in society complain of tiredness due to the stress and pace of their lives, it is an overused word which has lost its impact. It is partly my fault because when I say I am tired you can only compare it to your own level of tiredness. When you are chronically sick fatigue / exhaustion / tiredness take you to a whole new level one you never knew even existed. Sometimes even I am shocked that my body is still able to function when I am suffering from this level of fatigue. I also have on a number of occasions had this look on my face when someone has told me that they are in agony. When I am in agony my phone is the last thing I am looking at. 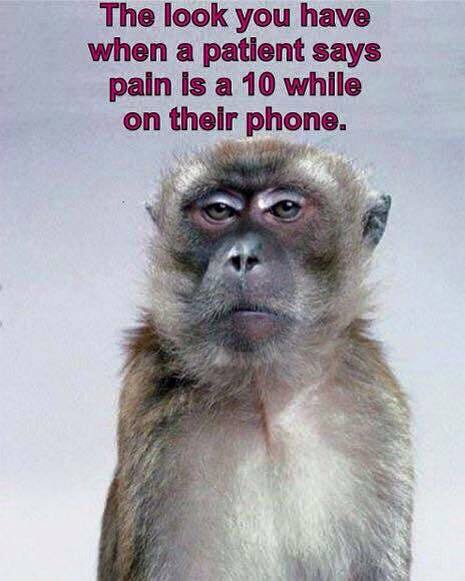 I am usually counting down the minutes until I know my pain medication is in my system. Pain is subjective, what I class as a 10/10 on the pain scale others may class as a 5. In my daily life I have pain, every single day. It is at a level where sometimes it is background noise and other days like today despite being almost maxed out on pain medication it is wanting to make itself heard. A 10 out of 10 pain for me is usually caused by bowel adhesions, the pain from these will cause me to black out. I use this as my 10 as I don’t have labour to compare it with. When you are female childbirth is always used as an example of a 10 out of 10 pain. Heaven knows what they tell men, I never get the male example given to me they are usually completely stumped when I utter the words “I don’t have kids”. Today clearly my pain is not at a 10 out of 10 level because I am typing my blog however to be able to do this my neck is in a soft collar (because since Saturday my upper back has been going in and out of spasm and the pain is originating from my neck. Possibly having my hair cut today was not a great idea.) and I have four hot water bottles placed on various parts of my body. I would rate my pain today a 6/10 it’s noticeable but not completely incapacitating. To someone who wasn’t used to this level of pain or who had a different pain threshold it could be their 10 or their 1. The word agony is thrown around quite easily, I think most of us would agree when you stub your toe it is sheer agony for a few minutes. It can in those few minutes be incapacitating but after a while the pain subsides. It may throb for the rest of the day but you can carry on your planned activities. Agony is not being able to go to work or walk around the shops or carry on with your planned activities. Agony to me is not being able to get out of bed despite taking enough morphine to sedate a bull elephant. Maybe I just see things through Chronic pain / illness tinted glasses but the word agony is being distorted through overuse. You can tell a doctor that you are in agony but get zero response, firstly because they can’t feel your pain and secondly you are probably the 10th person that day to tell them that. Agony is a lonely place to be because others don’t understand it and can not feel it. You can’t share it, you can only carry that burden alone and wait patiently for the meds to kick in. I find pain that creeps above a 7 on my personal pain scale starts to alter my mood. I become very angry, snapping at everyone and finding everything annoying. Pain at that level will move me towards “I’m not doing people today” because the pain is interfering with my brain so much I can barely function. So I get frustrated when people use the term at the drop of a hat. There are other words to use to describe pain discomfort (that would describe my current level of pain perfectly), sore, aching, throbbing and one of my favourite “twinge”. I have twinges in my back quite a bit. I don’t know if it is because we are becoming lazy with language or more and more people are discovering a flair for the dramatic but it is a pet hate of mine when others use the word agony when they clearly aren’t in agony. Unfortunately I use the word tired and the phrase “in pain” quite a bit. I imagine that also causes people to not hear what I am saying because they hear it so often. I need you to hear me, I don’t mention my pain until it’s hit a level that I can’t ignore, the same goes with tiredness. I am sorry if you don’t understand that however the problem is yours not mine. If you ask me how I am and I actually tell you the truth, you are amongst the privileged few. If I acknowledge pain in front of you, it has reached a level where my energy is being drained away and it is interfering with my cognitive function. I don’t tend to announce it as I don’t want to put a downer on the proceedings. If it’s mentioned I can’t physically or emotionally hide it anymore. I don’t want bucket loads of sympathy, I just want to be heard and acknowledged like everyone else on the planet. So understand me when I say I am tired or my back is hurting I don’t expect you to fix it but I also don’t want you to ignore it. I want you to respect that at this point in time I will not be the life and soul of the party, I will not be jumping to attention if you ring or text me. A little understanding goes a long way. I in turn will not diminish your pain or your level of tiredness after a long day at work because 9 years ago I was you.